Usually I don’t wake up early for any sort of sale because I feel that it isn’t worth it to be caught in a crowd of crazy people looking to save a buck. In this situation though, I’m glad I did. Savers is my go-to thrift store in Austin because it’s cheaper than Goodwill and if you look hard enough, you’ll find some great stuff like unworn shoes, fabric, sewing notions and sometimes vintage patterns! They always have a 50% off sale on the federal Monday holidays but if you have a Super Savers Club card you can get the discount the Sunday before, which is great because you can mostly avoid the craziness by showing up at opening time (10 AM). We went the day before to look around so we knew exactly what we were shopping for and hoped those items would be there Sunday. As my husband and I were waiting for the doors to open there were quite a few women that I assumed would go straight to the clothes and shoes, which they did luckily. From that point I knew I would be able to grab the fabric I wanted because it was ALL THERE:)! All of the fabric was 60″ across, which is an added bonus:)! 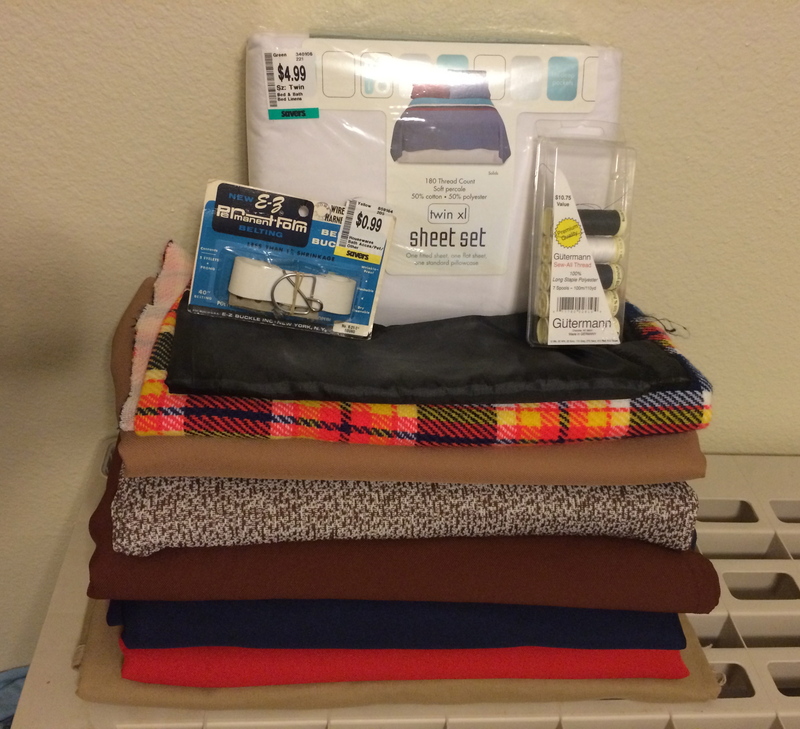 The price of all my sewing goodies? $17.50 before taxes. What a steal! I have enough fabric to last quite a while and Gabardine is wrinkle free so NO IRONING WOOOOOO! I encourage all of you to take a peek at your local thrift store before heading to Joann’s or Hancock. You’ll be surprised at what you may find! You are the thriftiest person I’ve met, except for my grandmother. During the depression she made dresses out of floursacks, and I still have my baby quilt made out of patches of polyester clothing. You should totally buy some vintage clothes and make a crazy quilt. One day when I have the money and time to look for vintage clothes:).